I'm definitely feeling under the weather today. It's really a bummer because I have so much work to do.... So, if you're reading this - and I owe you an email, phone call, report, facebook message, text, or anything else...I have a GREAT excuse. In fact, SANTA himSELF has pardoned me for being behind. Why? Cause he hired me to be a messenger for him. I didn't realize how much work he WANTED from me...shew....but, it's SANTA. And since I've asked him personally for a new car this year - I best do as I'm told. Today was the big GIVE - BIG BIG GIVE to a warm and deserving family! And this year, Jennaphr Frederick said she wanted to join me when I do the Secret Scooter Santa Drop! Ok, no - I don't stalk JennFred. But I do love to hang out with her! She's really freaking hysterical. What you see is what you get with her. She's got a great heart too. **SIDE NOTE** I can't wait to share with you a new feature I'm doing in 2015 that Jenn is kicking it off with me. You'll love it as it's an inside look on the hearts of some of my favorite moms. From celebs to neighbors & anyone I can get to come over that week.....lol... In the MomCave...coming soon to my YouTube Channel! In the meantime, my 2nd annual Secret Scooter Santa Drop with Razor was this morning!!! I WAS SOOO HAPPY! Not because I got to see Jenn although I always love seeing her - but because this GREAT GRANDMA got rocked with Razor (& some other random yet amazing toys I had left from the Kisses for Kyle Event.) -----> Speaking of Kisses for Kyle!! That recap is well on its way! AND a video I had produced too! So I promise that will be worth the wait. In the meantime, watch - share - and be sure to register for our contest!! Wild Style, Power Wings, A5, Mixi & Crazy Cart! The breakdown - Power Wings - AWESOME for moms (and great grandmoms). The Crazy Cart? I LOVE it - but I'm a nut about making sure it's with older kids. The younger ones are just so fragile! Besides, Razor says NINE and UP! Mixi is adorable. The A5 is a classic. And Wild Style is wild with style! DISCLOSURE: Razor did not provide compensation for this appearance. However, for the past two year Razor offered me up scooters to families. It was THEIR idea and there was no strings attached. That's a testament of what kind of company they are! And hopefully the fact that I take the great products I get and GIVE them away is a testament to who I am and what Real Mom Media stands for as well. Happy Holidays to you and your families! This week, I have the honor and privilege to hang out with my awesome friend Jennaphr Frederick on Fox 29 in Philly! We are SOOO mega excited to share that we have partnered with an amazing kids drink that is taking the kid-drinking-nation-by-storm! Real Mom Media & Rooibee Red Tea are working together to share the Rooibee Roo message to families all over the country. If you care about the sugar and gunk in so many other kids' drinks, you are really going to love the new line from Rooibee Red Tea, Rooibee Roo. Rooibee Red Tea recently launched their new line of teas just for kids. Who says teas are just for grown ups anyway? Rooibee Roo is uniquely delicious, wildly nutritious & just for kids! Discover what all the roaring, whooping & hollering is all about! Rooibee Roo is made from South African Rooibos Red Tea and has lower sugar than other kids beverages. Their certified USDA Organic, all natural teas rich in antioxidants, naturally caffeine-free, gluten-free and contains a full serving of Vitamin C. And they taste amazing! Rooibee Roo comes in a kid-size friendly BPA-free plastic bottle that is 8 ounces vs. the 12 ounce parent bottle. With only 12 grams of organic cane sugar and less than 60 calories a serving, it is within school nutrition guidelines. Rooibee Roo is excited to be at Blogger Bash this July in New York City and they want you to be there too! Rooibee Red Tea wants to send one blogger as their official Ambassador to Blogger Bash. So how can that be you? Create an Instagram video with your child(ren) sharing the Rooibee Roo cheer! Make sure you tag your Instagram video with the hashtag #RooibeeRoo. The contest will run through June 12, 2014 and the winner will be announced onJune 13, 2014. One winner will receive a VIP ticket to Blogger Bash NYC (valued at $250) along with a $500 travel stipend to attend the event. NO PURCHASE NECESSARY OR PAYMENT. A PURCHASE OR PAYMENT OF ANY KIND WILL NOT INCREASE YOUR CHANCES OF WINNING. 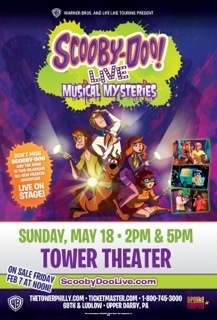 Scooby-Dooby is coming to the Tower Theater on Sunday May 18 at 2 pm & 8 pm. Scooby-Doo and the Mystery Inc. gang have been called upon to help solve an epic mystery!! It appears a trouble-making ghost is haunting a local theatre and Shaggy, Fred, Daphne, Velma and Scooby-Doo are off in the Mystery Machine to solve it! Filled with wacky new characters and hilarious antics, SCOOBY-DOO LIVE! Musical Mysteries has young audiences on the edge of their seats the moment the lights go down. Ticket are on sale now! Purchase your tickets through LiveNation. Showtimes: 2 p.m. and 5 p.m.
One lucky Real Mom Media reader will win a family four pack to see the show!